Fattoush is my favorite salad to eat in the summer, especially in August when the cherry tomatoes are fresh off the vine. This salad is very similar to the Italian Panzanella made with fresh basil and crusty bread, but uses fresh mint, cilantro and pita bread instead. 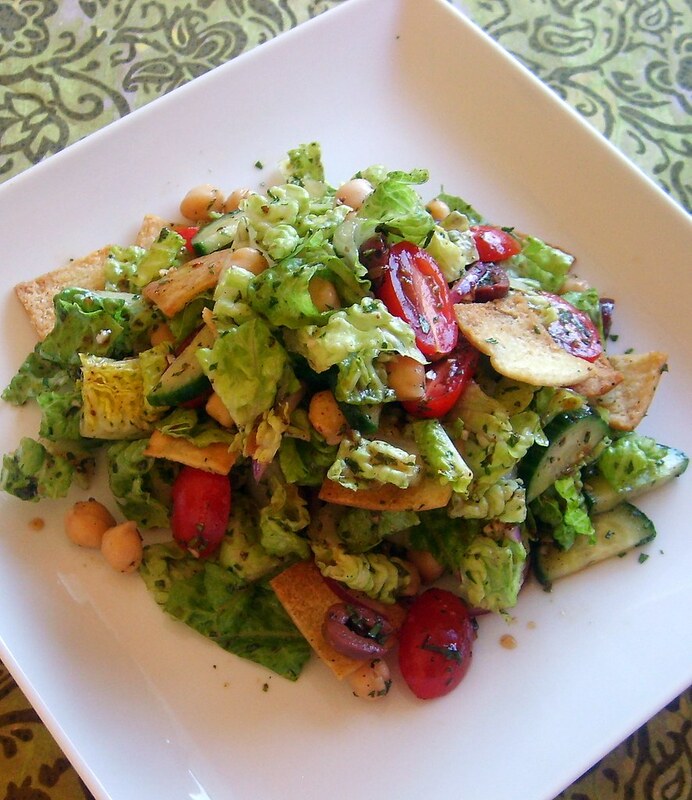 Fattoush salad can be served as a main course, or as a side to your favorite Middle Eastern entree. I just love the flavors and textures of this salad! Place all ingredients in a bowl and whisk in olive oil. If using fresh garbanzo beans, cook until tender about 45 minutes, drain and chill in the refrigerator until ready to use. Preheat oven to 350 degrees. Brush pita on both sides with olive oil. Cut pita or tear into bite-sized pieces and toast in the oven for 5-10 minutes until golden brown and crispy. Sprinkle with kosher salt and set aside. Add all ingredients to a large bowl, sprinkle with salt and pepper and toss with pomegranate vinaigrette to moisten.